Lake front cabin away from the hustle and bustle of the city, but still close to people and the small village of Fulford. As of October 2, 2018 -we are renting the cabin for a monthly fee of $1600 plus utilities based on 2 people occupancy. Not suitable for children. Pets upon approval. Right when you walk through the gate the peaceful restorative energy of Weston Lake welcomes you. Outdoor living is is a big part of the open grassland, the magical water lilies by the dock. Easy accessible from the main road. With carport area. The main cabin features large outdoor lounging areas furnished with couches and a dining table. Inside a large space welcomes you one open concept living areas with gas fireplace and Tv for movie watching. The entire cabin has high ceilings and a fabulous wall of windows that brings the outdoors in. The modern kitchen comes with stainless steel appliances fridge, stove, dishwasher, coffee maker, microwave, kettle and toaster. The cabin is for 2 people only Open concept living with a luxurious king bed in the loft, presents wonderful view of the lake with a closet and small dressing room. There are no walls separating the sleeping loft from the living space. A truly cozy and inspiring home with lake views and private access. There is a dock to relax and a canoe to paddle around the lake with . This part of the lake is clothing optional. Sound travels on the lake,, so we ask for quiet enjoyment, no parties and loud music! 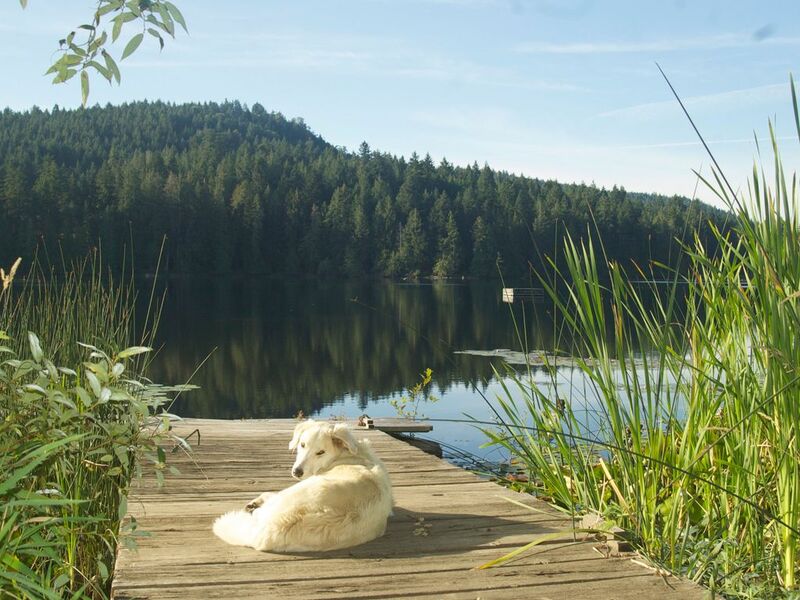 Salt Spring Island is the largest of the southern gulf islands, our property is situated on the South side of the island with an easy drive to the quaint Fulford Harbor and the hiking trails along the ocean of Ruckle Park. Only a 15 min drive to the main town of Ganges with wonderful restaurants, shops, theaters, and artist galleries. Once there, visit the famous Saltsrping Island Saturday Market, a food lovers paradise. The islands studio tours and gourmet food tours will surprise you with new found tasting grounds. Local Phone will be provided. We have a DVD player with a movie library. Total serenity. Loved exploring the lake with the kayak so thoughtfully provided. Great to have you stay with us, and hope to see you again! Exactly what we were needing! It was an absolute pleasure to have you at the Lake House. I'm hoping you visit us again. My daughter and I stayed three nights. Everything you need and very comfortable. Peaceful lake house retreat away from it all. Just perfect. We couldn't have asked for a nicer, more comfortable place to stay on Salt Spring Island. The property is in wonderful condition, clean, great kitchen, super comfy king size bed, and plenty of space for two people to relax and unwind. All the different seating arrangements around the property are wonderful and added so much to our stay. It felt like we had an extra 'outdoor' room outside the cottage. Private lake access, with more seating, and a canoe to paddle around the lake are amazing additions to the cottage. The lake was beautiful to swim in, the private lake access is only a short swim away from a small mounted dock for sunbathing and hanging out on the lake. The owner was very responsive to messages, very considered of our privacy throughout our entire stay, and overall wonderful to communicate with. We would definitely come back and highly recommend this property to anybody looking for a get-away. Thank you - You were wonderful guests and I can only be grateful to share the property with lovely people like you! Gorgeous property and beautiful Lake! Had a wonderful 4 day stay at this beautiful property- only steps from your own little dock on a gorgeous lake. Water was warm, fish were jumping and the birds were singing. Very dog friendly with full fencing and our pup loved hanging out on the dock. Numerous places to relax as there are outdoor chairs and sofas dotted about the property. Loved the inside- modern kitchen and very comfy bed. Private and a perfect couple with a dog vacation spot... We will be back! The Weston Lake House was everything we hoped for and more! Private, clean, comfortable, and tastefully decorated. A perfect place to rest and relax! The owner has created a number of outdoor seating situations that can be used whatever the weather. Swimming off the dock and basking in the sun were sublime! The owner was a wonderful host; very friendly yet respectful of our privacy. Wish we could have stayed longer but you can bet we'll be back! PAYMENT: At the time of booking, 50% the full payment is required to secure the reservation. When booking within 14 days of arrival date, full payment is required. CANCELLATIONS: Full payment is refundable up to 14 days prior to scheduled arrival date, less $100 administration fee. If cancelling within 72 hours, you will be charged for the entire stay, unless we can fill your reservation.